Choe Hwi (tagged) on a tour of Ch’angsong County, North P’yo’ngan Province, with Kim Jong Un in June 2013 (Photo: NK Leadership Watch file photo). Choe Hwi [Ch’oe Hwi] is a deputy director of the Workers’ Party of Korea [WPK] Propaganda and Agitation Department [PAD]. Choe is also a member of the WPK Central Committee. Choe has spent his career in the DPRK’s arts sector and as an official of the Youth League. His first significant position was during the mid-1980s as a manager of the P’ibada (Sea of Blood) Opera Troupe. 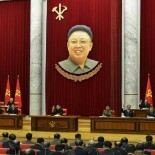 In 1987 he was appointed head of the Pyongyang Art Troupe. During the late 1990s Choe served as a Vice Chairman of Pommrinyon (Pan National Alliance for Korea’s Unification) and participated in unification and inter-Korea-oriented events. In 1996, Choe Hwi migrated over to the Youth League and served a secretary on its Central Committee, focused on extracurricular education. He accompanied the Pyongyang Schoolchildren’s Art Troupe on a visit to China in 1999. In 2000 he returned to heading up the Pyongyang Art Troupe he was the vice chairman of the DPRK-Sudan Friendship Association. In 2004 he was working as a WPK Central Committee Department deputy director. He was involved in the establishment of the U’nhasu Orchestra and the Moranbong Band. Choe Hwi (tagged) poses for a commemorative photo with DPRK musical ensembles prior to departing for a December 2015 visit to China (Photo: NK Leadership Watch file photo). In April 2013 Choe was appointed senior deputy director of the WPK Propaganda and Agitation Department. During 2013 and 2014 he was a relatively routine member of Kim Jong Un’s (Kim Cho’ng-u’n’s) entourage during on-site visits and inspections. He was elected a deputy to the 13th Supreme People’s Assembly in March 2014. In December 2015, Choe Hwi led the Merited State Choir (State Merited Chorus) and the Moranbong Band on a railway visit to China for a limited series of concerts. At the last minute, the concerts were canceled. Choe Hwi spoke at the opening session of the 7th Party Congress in May 2016. During the party congress he was elected a member of the WPK Central Committee. Choe was born in 1954.